This amazing training system is all about increasing distance and consistency. With six weeks of regular practice, golfers can expect to improve the speed and power of their golf swing by five to eight percent! 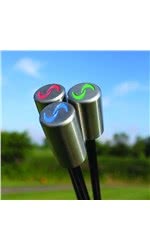 Featuring three colour coded weighted “clubs” specifically designed for men, (women, seniors and juniors sets are also available) plus a unique set of practice drills, the team at SuperSpeed believes it can help get your golfer hitting the ball farther than ever before! This lightweight, sleek and super comfortable to wear golf watch is the ultimate gift for today’s golfer. Simple and easy to use, the S10 comes pre-loaded with over 41,000 courses worldwide. 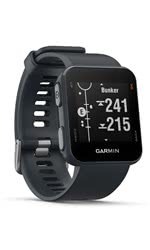 Giving golfers the yardages from the front, back and middle of the green, they can also upload their scorecards to Garmin Express to keep track of rounds. 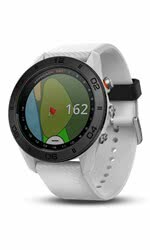 Another amazing watch option from Garmin, the S60 GPS features the brand’s Play Like Distance Technology, adjusting yardages to account for uphill and downhill shots. Its touchscreen tech then allows users to manoeuvre the pin to an exact spot for a more precise distance to their target. 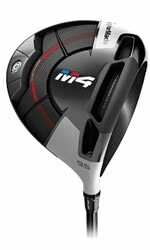 Featuring TaylorMade’s innovative Twist Face Technology, the M4 Driver will look incredible under the tree this Christmas. Curved open in the high toe area of the face for more loft and curved slightly closed in the low heel to reduce loft, this unique design promises to garner your golfer more fairways than ever before. Incredible geocoustic technology delivers a solid, explosive sound at impact as well as a larger, more forgiving face every golfer will love! The perfect gift for the beginner or game improver golfer. 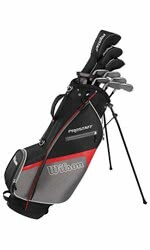 Help your loved one to play better, more consistent golf with this incredible package set from Wilson. Featuring all the gear they’ll need to get out on the course, the Prostaff HDX has been specifically designed to help golfers achieve maximum distance and forgiveness. 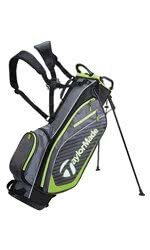 This spacious stand bag offers great stability and a 4-point adjustable backpack strap for maximum balance and comfort. Available in four sleek colour combos, you can’t go wrong with this gift purchase. If your golfer has a cart, check out the Pro Cart 6.0 Bag. Featuring a spacious top cuff design, loads of pocket room and a lightweight construction, this bag is perfect for year-round performance. This super cool push trolley is available in 10 vibrant colour options, giving you loads of choice when it comes to picking out the right gift for your golfer. Featuring the “Rack and Pinion” design that has been used in cars for years, the R1-S is super easy to put up and take down. Make your golfer’s Christmas extra special by not only treating them to a dozen of their favourite golf balls, but by also having them personalised for that extra special touch! Titleist and Srixon are offering free Personalisation of all golf ball dozens. Callaway is offering free personalisation on their Chrome Soft and Chrome Soft X dozens. Give the gift of sleek, on trend style that will keep him warm on or off the golf course. This stylish pullover features a lightweight fleece construction with a brushed inner layer and Under Armour’s proven moisture-transport system. 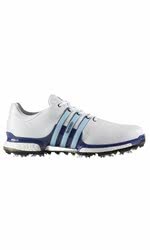 Treat your golfer’s feet to incredible comfort, cushioning and endless energy return with these super stylish adidas Golf Shoes. Combining a contemporary look with tons of performance enhancing features, these shoes are perfect for year-round wear on the golf course. A 1-year waterproof warranty, only helps to sweeten the deal! From now until 31st December 2018, whenever you purchase any NEW Motocaddy S-Series trolley with a lithium battery, you can claim a Motocaddy golf bag for free. Choose from a variety of incredible options that are available throughout the S-Series. PowaKaddy is also offering a free golf bag deal this season. Purchase a new PowaKaddy Lithium electric trolley, between now and 24th December 2018, and claim a free cart bag, worth up to £229.99!